1. Cut the pears in half lengthwise. Scoop out the seeds with a spoon or melon baller. 2. Place pears in a baking dish. Fill centers with chopped walnuts and drizzle about half a teaspoon of honey or brown sugar over each pear half. 3. Sprinkle each half with cinnamon and cranberries. 4. 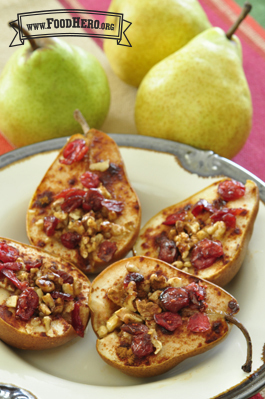 Bake at 350 degrees for 25 to 35 minutes or until pears are soft when poked with a fork. Serve warm.